Henry Mckenna was an Irish immigrant who came to Kentucky in 1837. With a background in distilling, Mckenna brought with him the generations-old family Whisky recipe and set up shop in Fairfield, Kentucky — just about five miles from where the current Heaven Hill Distillery is located in Bardstown, Kentucky. The story of Heaven Hill is quite a tale to tell in itself. They started back in 1933 and remain the only family-owned distillery in Kentucky, with the second largest inventory of Bourbon in the world. In 1996, Heaven Hill's production plant was almost completely destroyed by fire. The company survived and while fermenting, mashing, and distilling now occurs at the new Louisville distillery, aging, bottling, and shipping still occur in Bardstown. The question is – what do good ol’ Henry and Heaven Hill have in common? Well, besides the location, the love for Bourbon, of course. 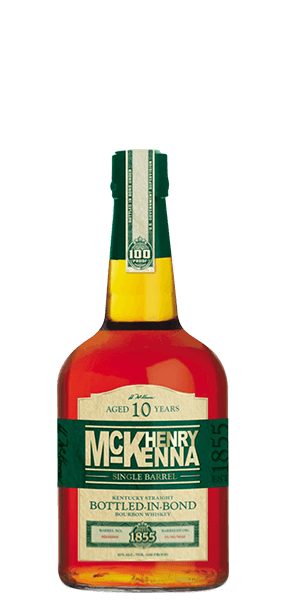 Now, you take that love for Bourbon, combine it with the classic Heaven Hill mash bill (75% corn, 13% rye & 12% barley), almost a hundred years of tradition, 10 years in the barrel, and you get Henry McKenna Single Barrel 10 Year Old Kentucky Straight Bourbon. The Whiskey is Bottled-in-Bond* at 50% ABV and represents everything a proper traditional Bourbon’s supposed to be. It’s tasty, aromatic and packs quite a punch as well. Perfectly balanced. Last but not least – it represents outstanding value for money. It drinks like a Whiskey twice the price. But it doesn’t pretend to be something it’s not. It’s just a good old-fashioned straightforward Bourbon made with competence and love. Henry would approve. *Any spirit labeled as Bottled-in-Bond must be the product of one distillation season and one distiller at a single distillery. Also, the law requires that bonded spirits be aged in a federally bonded warehouse under U.S. government supervision for at least four years and bottled at 100 proof (50% ABV). Henry McKenna is the longest aged Bottled-in-Bond available today, resting in the barrel through 40 Kentucky seasons. What does Henry McKenna 10 Year Old Single Barrel Kentucky Straight Bourbon taste like? The Flavor Spiral™ shows the most common flavors that you'll taste in Henry McKenna 10 Year Old Single Barrel Kentucky Straight Bourbon and gives you a chance to have a taste of it before actually tasting it. My mom used to wax poetic about Henry McKenna when she used to live in the south. This is a real darn good bourbon for the price point. Heck forget the price point. It is a darned good bourbon. Can't beat it for the price of a bottle in bond. I'm sure since it just won best bourbon it'll start selling out everywhere and be impossible to find. If you see one buy two. Smooth and rich. Love it! It’s like drinking a liquid Cinnabon Roll - cinnamon, honey, butter, vanilla and some warm bread. Fantastic!! A sharp front end bite. This is coming from a loyal heaven hill fan. Really difficult to beat for the price. A solid 10-year BiB bourbon for under $50. For a daily drinker, this juice is a hidden gem. Bold caramel flavor at the end, lingers long enough to enjoy but short enough you want another sip. Amazing bottle, if you get a chance to try this, don't miss out! Soon to be as hard to find as any! Very solid for the price range for a 10 year. If you can find this one for 35 and below, worth having. Damn good. Sweet and smooth. Strong smell of alcohol in beginning with a smooth sweat Carmel taste in middle followed by slight peppery finish. I would recommend. I like the kick at first, then the oak and slightly floral taste that lingers in. Very enjoyable. Thanks for the bottle Brandon. What's not to like? This is a great go to drinker. Smooth neat. Enjoyable. A ten year bottled in bond under $40, how can you go wrong? Try it, you will not be dissappointed! Very smooth, with complex flavor, should be a go to for bourbon drinkers, and the price is nice too. Good everyday bourbon. Has a kick but not a lot of complex flavors but as the other reviewer says, check the boxes. Absolutely love the balance. You can taste a subtle red licorice. Smooth and full of flavor. Can rarely find it here in northern Indiana. Very smooth no bite like some bourbons . The price is reasonable and I like it better than some bourbons that cost way more. AMAZING FOR THE PRICE. GREAT BOTTLE. One of my favorite, affordable bourbons. Vanilla and Carmel nose, smooth and fruity flavors, with a smooth and spicy finish. Love it on ice with a splash of water. The best bourbon under $30 that we may ever see. Smooth, minimal spice, and a huge cherry bomb on the finish. I love it. It's never been a disappointment. No one would blink if this bottle was priced 25% higher. It should be renamed "Bang for your buck!" This is a fantastic bourbon for this price point. It checks all of the boxes for a classic bourbon flavor profile. Vanilla...check. Caramel...check. Oak...check. Spice...check. It even has notes of sweet tea on the finish and aftertaste. This is the perfect bottle to introduce someone into the world of bourbon. I get strong caramel and vanilla on the front end with the bang of fire on the backend. Great bottle for the price point. Not bad whiskey, but not what I expected from a 10 year old bourbon. Very smooth, mild flavor for the proof. I was talking with an older gent in Total Wine who was looking for Henry McKenna 10 and they were sold out, again! I found a bottle and I can see why the sell out, it's very enjoyable. In my mind, this tastes like a mainstream bourbon, in the best way. It's not over-the-top interesting for sure, but it checks the boxes you want checked. Makes for a great cocktail bourbon, better than most. Needs lots of ice, or just a splash of water. Very good though. Cinnamon, spice, caramel and a bit of fire. For the price, this is one of the most flavorful bourbons available. In a flood of new distillers and craft whiskeys this one stands out. They have found the balance between grains, cut, aging, and barrel char that makes this one of my favorite bourbons. Even at 100 proof it tastes of spice as opposed to alcohol burn. Pretty good, but has a lingering warmth that may be too intense for some people. What a bargain. It's definitely a sipping bourbon, but I felt it needed a drop or two of water to open up/account for it being 100 proof. Highly recommend. You cannot go wrong with this 10 year old bottle and Bond it has everything a whiskey should be, Carmel, maple, light smoke, from smell on the nose to the warmth on the palette it's got it to sip and make it a summer night. Great price point for a 10 year. Excellent everyday sipper. At that price point there is no finer bourbon. Good, I enjoy it after a hard day working outside. This is one of my favorite bottles. It has a nice worthiness to it that really sets it apart. This bourbon is exactly what it says it is, the “Everyday Table Bourbon”. Heavy on wheat, light on rye, yet with more kick than other wheats such as Makers Mark. Fantastic on it’s own, but it shines in the perfect Old Fashioned with it’s hit of cinnamon & slight caramel notes from the charred oak. This is a staple in our household, especially since the price is below $35.00 in Indiana stores! Excellent smooth tasting bourbon. Best everyday bourbon at a very reasonable price. Not a bad price, but a little harsh on the ethanol flavor. This gets a 10/10 for price to quality ratio. My favorite table bourbon for the money. Where else can you find a 10 year old single barrel bottle in bond bourbon for this price? This should be on everyone's shelf who likes whiskey. Very flavorful on ice or neat. Very solid, and a great value at $33. Not many products can wow you in this price range, but Henry McKenna 10 year is one of them. At this price, its affordable to have a bottle on hand in your bar at all times. Notes of peanut butter! Yum! A great value. Smooth but flavorful. Definitely more of an easy sipping whiskey than you would expect from a 100 proof bottle. I enjoyed how simple it was, good flavor, everything I expect out of a bourbon that you have neat at the end of a long day. A nice surprise. A heavy nose of cinnamon and perhaps vanilla, with the taste to back it up. A strong spicy finish that gives way to a butter scotch fruit after taste. Very nice. One of the best kept secrets in bourbon. Great bib. Full of flavor. Nice long finish. Heaven hill knows how to do it. Smooth with nice flavor notes, not a real strong finish but solid. Enjoying it ! Just a NICE mellow Bourbon. Great nice and smooth . For the price, this is a go to bourbon for me. I really enjoy the aroma, the spice and finish. I would recommend this to anyone who is looking for a good bang for the buck! So far one of the smoothest bottled in bond bourbons I've tasted. Spicy yet smooth. You can definitely tell it's 100 proof. Recommended by local bartender I trust. Smooth and rich, however a little too sweet for my taste. Overall great for the price and very good. Good for it’s price. Definitely as after taste spiciness. Still smooth at the same time. One of my favorites. Smooth and flavorful. There are better bourbons out there, but this is one of the best for the price. A very good daily sipping bourbon. Top notch for the price!! have an Eagle Rare instead! Very smooth easy to drink-10 year old single barrel for this price is hard to beat. Great nose of vanilla and barley. Zesty palate with complexity and a bit of a bite. Great value for a 100% proof bourbon that a scotch drinker would enjoy. This bourbon as beats the darlings at my house in every blind tasting. Amazing and under the radar.